And I am the thoughts of all people Who praise my beauty and grace. I saw a stranger last night. He blessed myself and my cattle and my dear ones. 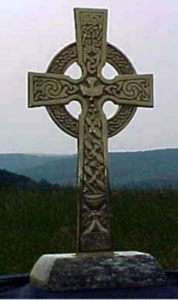 I love learning about Celtic Christianity. To learn the stories of the courageous, spirit-led men and women who first brought God’s breath to these murky shores. Their stories are in some ways so alien, as they are many centuries removed, yet so human, so filled with the God of grace that one can’t help but be fascinated by the stories of Columba, Aidan, Cuthbert and Hilda. And then later we have the same spirit working through Lady Julian, John Bunyan. Later still the Wesleys, William Wilberforce, the Booths… Truly amazing. What a rich spritual heritage we enjoy!